Marines look on during work to fortify the border structure that separates Tijuana, Mexico, behind, and San Diego, near the San Ysidro Port of Entry, Nov. 9, 2018, in San Diego, CA. The U.S. government said it was starting work on Tuesday to "harden" the border crossing from Tijuana, Mexico, to prepare for the arrival of a migrant caravan leapfrogging its way across western Mexico. Customs and Border Protection announced it was closing four lanes at the busy San Ysidro and Otay Mesa ports of entry in San Diego, California. It said the closures were needed "to install and pre-position port hardening infrastructure equipment in preparation for the migrant caravan and the potential safety and security risk that it could cause." That still leaves a substantial path for the tens of thousands of people who cross daily: Twenty-three lanes remain open at San Ysidro and 12 at Otay Mesa. The caravans became a campaign issue in U.S. midterm elections and U.S. President Donald Trump has ordered the deployment of over 5,000 military troops to the border to help fend off the migrants. Trump has insinuated without proof that there are criminals or even terrorists in the group. To the thousands of Central American migrants making their way toward Mexico's Pacific coast state of Nayarit, the prospect of meeting a hostile reception at the border is nothing new. After a month on the road, through three countries, migrants like Maribel, 22, from La Ceiba, Honduras, are used to tough conditions. Maribel, who did not want her last name used for fear of reprisals in Honduras, pushed a baby carriage with her 1-year-old daughter while her husband pushed another with their 3-year-old son along a highway leading from Guadalajara to the Nayarit capital of Tepic. "We are well aware of everything Trump has been saying," said Maribel. "Let them close whatever they want to close, but we are going to get through anyway." The thousands of Central American migrants left shelters in Guadalajara early Tuesday and were taken by bus to a highway tollbooth to wait for rides to their next destination. They thought other buses would be waiting for them to take them through hurricane-ravaged Nayarit to the neighboring state of Sinaloa, further north. But no other buses showed up and few trucks passed to pick them up, leaving many to walk. Most appeared intent on taking the Pacific coast route northward to the border city of Tijuana, which was still about 1,350 miles (2,200 kilometers) away. 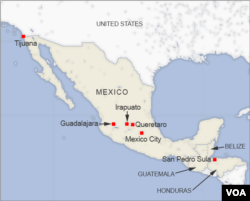 The migrants have come about 1,500 miles (2,400 kilometers) since they started out in Honduras around October 13. While they previously suffered from the heat on their journey through Honduras, Guatemala and southern Mexico, they now trek along highways wrapped in blankets to fend off the morning chill. While the caravan previously averaged only about 30 miles (50 kilometers) a day, the migrants are now covering daily distances of 185 miles (300 kilometers) or more, partly because they are relying on hitchhiking rather than walking. Migrants have hopped aboard different kinds of trucks, regardless of comfort or safety. Some have stacked themselves four levels high on a truck intended for pigs. On Monday, a few boarded a truck carrying a shipment of coffins, while others squeezed into a truck with narrow cages used for transporting chickens. Many, especially men, travel on open platform trailers used to transport steel and cars or get in the freight containers of 18-wheelers and ride with one of the back doors open to provide air flow. Last month, a Honduran man in the caravan died when he fell from a platform truck in the Mexican state of Chiapas. A smaller, second caravan began arriving in Mexico City on Monday. By Tuesday, over 1,000 migrants had set up camp at the same Mexico City sports complex the larger caravan left Saturday. A third caravan was heading toward the capital. Many say they are fleeing rampant poverty, gang violence and political instability primarily in the Central American countries of Honduras, Guatemala, El Salvador and Nicaragua. Mexico has offered refuge, asylum or work visas, and its government said Monday that 2,697 temporary visas had been issued to individuals and families to cover them during the 45-day application process for more permanent status. Some 533 migrants had requested a voluntary return to their countries, the government reported.